Edward dies in his living room, surrounded by his wife and children. The first night, we do not move him, placing a beautiful quilt over his body and lighting dozens of candles. Gradually the house fills up with people, bearing food and flowers. The sound of tears and laughter intermingle with the kettle whistling, stories being told and children running in and out. I go in to check on Edward and see his daughter and her best friend standing beside him. They are shyly touching his hands and forehead, and whispering words of good-bye. 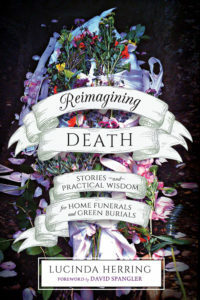 In a home funeral vigil, death takes its natural, rightful place in life again; interwoven in ways we have forgotten, in ways we are now remembering. Here, in his own home, a man’s life is celebrated, and his death made holy. 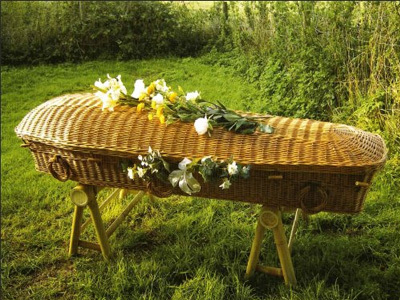 Fourteen year old Edith lies in a body bag in an open casket upstairs. Killed suddenly in a car accident, she has come home from the hospital for a three day vigil. In the familiar and comfortable environment, Edith’s entire class from the Waldorf school comes with their teacher to sit around her body. They share feelings, ask questions, write notes and poetry, and sing songs of farewell. Without consulting one another, almost everyone has brought sunflowers. The room is full of them. Edith’s mother shares how that morning she walked in the rose garden outside and discovered two tall sunflowers towering among the roses. The owner of the house swears they had never grown there before. A home funeral vigil space is an opportunity for family and friends to work with the shock of sudden unexpected death together. Giving ourselves more time and space at the threshold can help us be present to the mysteries that always emerge in a person’s transition from life to death. Surrounded by family, my mother takes her last breath by a window overlooking our forest home. Five minutes later a summer storm brings lightening, thunder and torrential rains. I, christened the “wild sister from the West” by hospice, have given up on the idea of caring for my mother’s body and keeping vigil. But my wish comes back to me. Shockingly, the hospice nurse’s car is destroyed in a flash flood (she survives) and all my mother’s death papers float away. No one can easily reach our mountain cove until morning. Papa willingly sleeps next to his wife one last night, and says later it gives him the time he needed to say good-bye. We are able to bathe and dress Mama, while the grandchildren paint pictures to place in her casket. As the men of the family carry my mother’s casket out the front door of the log cabin, a wood thrush sings and the water from our spring, rising up when Mama died, returns to its source beneath our mountain. It is a gift to work with the elements of the natural world at the threshold of death. Creating home funeral vigils help make this more possible. A Tibetan family calls A Sacred Moment, our funeral service. They have heard we can help them bring their mother home from the hospital. We can also support them in creating a vigil time and space, where family, lamas and other practitioners can conduct spiritual practices that are in keeping with their Buddhist faith and tradition. The mother was a great practitioner so the family feels it is very auspicious that such an opportunity is actually available in the Seattle area. I am honored to be the staff member on call, and awed that I know the Buddhist practices for the dead myself, and can help bring a Rinpoche from the island with me. It turns out he has a lineage and karmic connection with the woman and her family, though they have never met in this life. 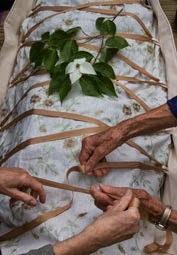 Home funeral vigils honor the innate right of cultural and spiritual communities to care for their own dead with specific meaningful practices and traditions.